Political, economic and legal aspects in ethnic and national minority conflict resolution. Cultural diversity of Central Europe. Impacts of European Union accession policies/processes. This interdisciplinary and cross-cultural meeting welcomes presentations on the cultural studies, sociology, geography, political science, law, history and economics research and cross border cooperation within the wider Central European region. 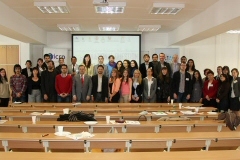 The conference is supported by the Institute for Cultural Relations Policy (ICRP) and King Sigismund College (ZSKF). Its aim is to serve as a meeting point to facilitate the public exposure of the perspectives and interests of different communities, governments, international organisations, NGOs, businesses, scholars, thinkers and common citizens. Invited speakers include diplomats, scholars, acting and former leading politicians or government officials from across Central and Eastern Europe. • Prof. Dr. Tibor Várady Former Minister of Justice of the Federal Republic of Yugoslavia. University Professor at the Legal Studies Department of the Central European University, Budapest, Hungary. Member of the Hague Permanent Court of Arbitration. Member of the Serbian Academy of Sciences and Arts and the Hungarian Academy of Sciences. • Dr. Levente Salat President of the Ethnocultural Diversity Resource Center (EDRC Romania), Associate Professor at Babeş-Bolyai University, Cluj, Romania. Member of the Scientific Council of the Research Institute of Ethnic and National Minorities, Hungarian Academy of Sciences. • Oľga Gyárfášová PhD Co-founder, Program Director and Senior Research Fellow of the Institute for Public Affairs (IVO Slovakia) and lecturer at Comenius University in Bratislava, Slovakia. • Ádám Szesztay Director of the Strategic Planning Department of the Hungarian Ministry of Foreign Affairs. 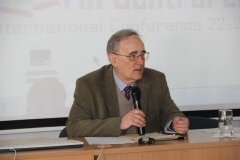 • Prof. Dr. Lia Pop Dean of Faculty of Political Science and Media Studies, University of Oradea, Romania. • Katinka Beretka Member of the Hungarian National Council in Serbia. • Conference days consist of lectures by invited speakers, members of ICRP Advisory Board as well as presentations of guest speakers and Q&A sessions. Optional sightseeing programmes on last day of conference. • Best presentations will be selected by a panel of judges and awarded during the closing ceremony. • Submitted and confirmed papers will be published online and will be archived on DVDs. • In case of large number of participants, papers will be published in conference book as well. • The main language of the conference is English (English and Hungarian for guest speaker applicants). • Group sightseeing in Budapest is also part of the program. How to apply for participation (listeners)? The application is a two-step procedure and it includes the submission of Registration Form to conference@culturalrelations.organd payment of registration fee (45 EUR*). Deadline of submission & payment: 11 March, 2013. The application is a two-step procedure and it includes the submission of Registration Form to conference@culturalrelations.organd payment of registration fee (90 EUR*). Deadline of submission: 11 March, 2013. Authors will be notified of conditional acceptance or rejection within 5 working days after each submission. Registration fee shall be paid by bank transfer OR cheque prior to event OR at the same time as first day registration. * NOTE that the international money transfer fee is 15 EUR. If you intend to transfer the conference fee outside Hungary the total sum will be 60 EUR for listener registration and 105 EUR for speakers. In order to reduce money transfer costs, speakers are entitled to make payment in cash during the registration (original speaker registration fee 90 EUR). The Conference venue is located in the 3th district, on Kelta utca. • bus nr. 134 from Szentlélek tér (Árpád híd, Buda side) to Újmegyeri tér bus terminal. • bus nr. 34 from Árpád híd metro station (M3, Pest side) to Újmegyeri tér bus terminal. • bus nr. 204 from Rákospalota, Kossuth utca, Újpest Központ metro station to Békásmegyer suburban railway station. Dadiana Chiran Roma economic empowerment. Roma-minority between welfare state and poverty policies. Perspectives from Hungary and Romania. Dr. Fethullah Bayraktar: The remedial secession theory: Is it a democratic response to unresolved national and ethnic conflict?